As Chelsea have shown on several occasions this season, they have the ability to squeeze the life out of a match and although the scoreline suggests a close game, the lack of opportunities Swansea had (especially in the Second Half) suggest this was a mildly encouraging performance with the game against Villa to come rather than a heroic toe-to-toe battle with one of the biggest teams in Europe. Starting Bony on the bench after taking him off against Everton suggests (probably rightly) that Laudrup's efforts are focused heavily on the Aston Villa game on Saturday. It's also a prudent step given Bony's relatively recent return from injury and the lack of striking options given Michu's injury and Alvaro's poor form but does take some of the excitement out of playing a team such as Chelsea as it pretty much says 'we've come for a draw'. This is the balance any manager has to take, between the balance of being in the entertainment business and the results business. With regards to Alvaro, I made the point a few months ago that although he's a class player anyway, it probably didn't do Michu's confidence any harm that he scored from his first shot in a competitive game as a Swansea player. Alvaro's performances haven't been terrible but ultimately as a striker you're pretty much just judged on how many goals you've scored and it's 0 so far for him, although in his defence the only two 90 minutes he's played in the league have been away to Chelsea and Man City (he's played 402 minutes in all competitions this season which is the equivalent of 4.5 full games). When you consider the striker issues Chelsea have had (no Chelsea striker scoring in an away league game in 2013), it's too early to give up on him yet and label him another Shechter (who himself, more by accident than design was technically the 'most valuable player' for Swansea in the league last season). 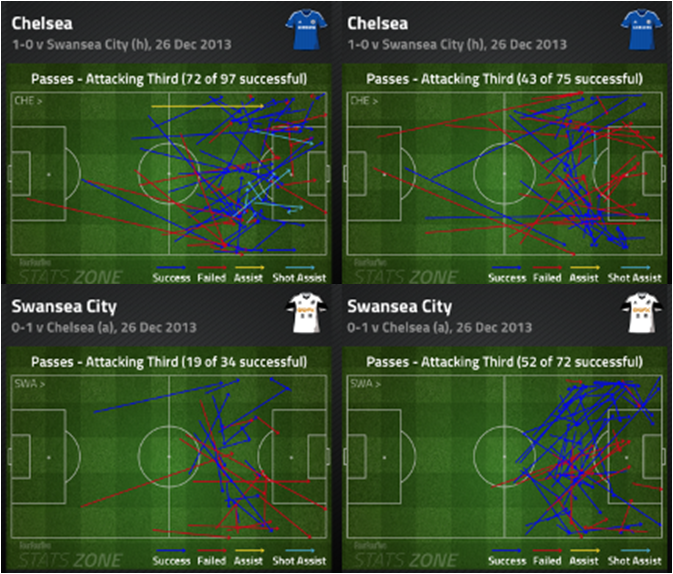 When you compare what each side did when they had possession in good areas there's a marked difference, Chelsea (in the first half at least) turned good areas into shots where Swansea have the ball in good positions in the Second Half, but not of them were converted into attempts. 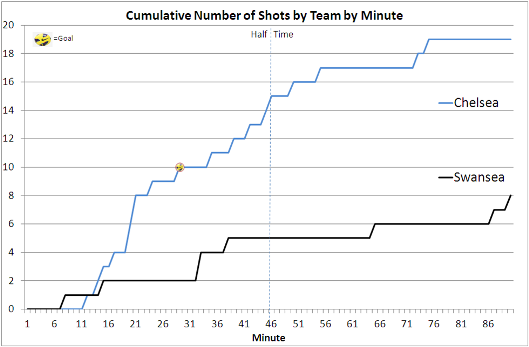 Possession stats are often derided, but they do at least show that you did have the ball some of the time and the opportunity to do something with it, but 8 attempts overall and only 3 in the Second Half it shows that something is not quite clicking in terms of turning possession into attempts. Part of it will be teams happy to sit deep and be content to just have 35-40% of the ball but better opportunities e.g., 3 v 3 on the break but the better you are at converting possession, the less willing teams will be to just sit deep. 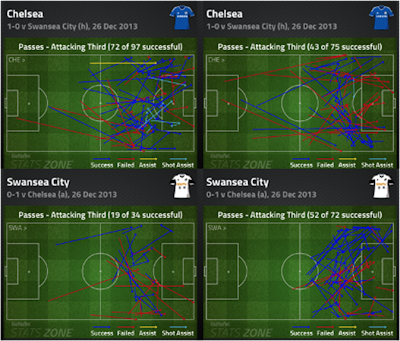 Swansea shots by half, despite plenty of the ball in the 2nd half, Swansea only with 3 attempts. Two long range shots and a Bony header which would take something to go in from that distance. It seems as if its gone beyond a joke now, but again corner taking seemed pretty abysmal and it's got to the stage where you start to question the value of sending central defenders up as it's arguable that our corners are more threatening for us due to having players out of position than they are an opportunity to score. In terms of positives, it's always great to see Leon play, but I wouldn't be surprised if that means he's not starting against Villa. With only 48 hours between games it may be that the midfield 3 starting against Villa will be Canas, De Guzman and Pozuelo with Bony up front, which although it may not be the first choice line up is something which could be well worth watching.